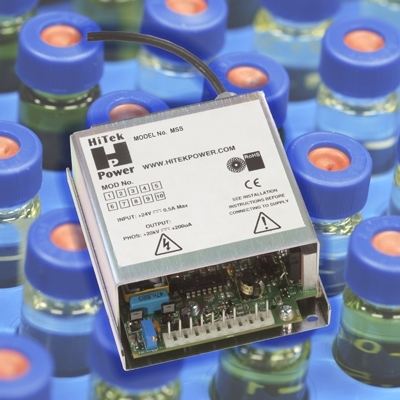 HiTek Power Ltd, a world-leading manufacturer of standard and custom-designed high-voltage power supplies, has used its expertise gained over many years of developing custom supplies, including designs for mass spectrometry applications, to introduce the first of a number of families of standard modules for this market. The Series MSS is a range of compact general-purpose modules for applications that require a small footprint with high levels of performance. The supplies offer a 5W output at voltages between 5kV and 20kV, depending on model, in a unit measuring just 115mm wide, 98mm high and 47mm deep. The MSS units provide reliable operation, even under short-circuit or arc conditions. Setting of output voltage is by means of an internal or external potentiometer, or an external voltage. HiTek Power is a world leader in the design and manufacture of high and low voltage power supplies that provide complete custom solutions for a wide range of OEM applications. A global company with its manufacturing facility and head office in the UK, HiTek Power also has sales operations in the US, Germany and Japan, as well as affiliates in China and Taiwan. HiTek Power currently employs over 100 people, including a large staff of qualified design engineers and technology specialists, committed to developing innovative high-quality power solutions.